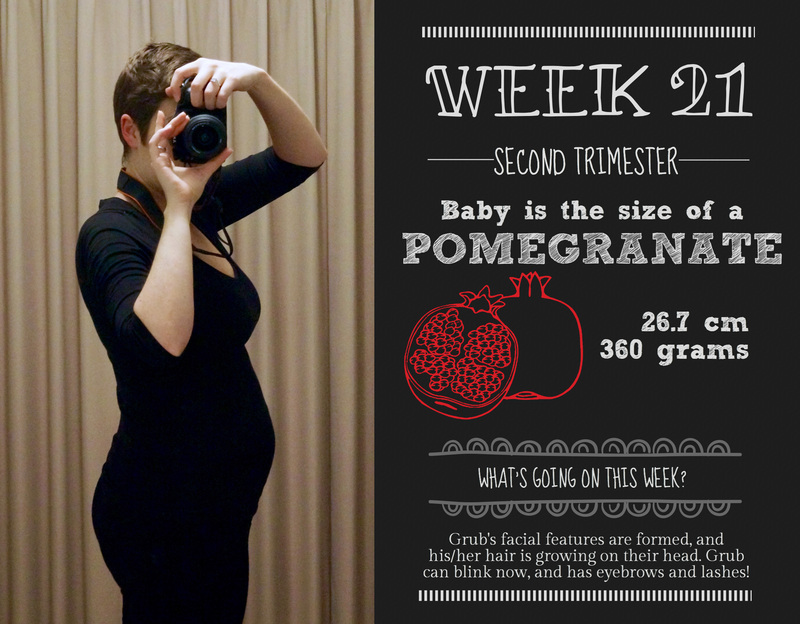 Baby: Heading a bit hipster this week, Grub is the size of a very trendy pomegranate! What I’m cooking: A baby with hair, eyebrows, and eyelashes! Grub’s face is fully developed now, and its features are now formed. Grub is also now using their digestive system, and making some yummy meconium to poop into its first diaper. How lovely! Main symptom: Oi my hip! Still sore on the right side, and of course we’re in the depths of winter, which isn’t making it much better. I’ve been horribly slack with yoga these last couple of weeks, so I’m planning on getting back into it ASAP to deal with the ache. What’s on this week: Back to work (sob!) and back to normality for a while – the scan and hospital appointment are done, so there’s a few weeks of business as usual before any new additions. On the plus side, my prenatal yoga classes start up again this week after a 3 week break, so it’ll be great to get some stretching it with some other bumpy women! On the plus side, the cot’s up!! Yay Mr Nester!! He and a lovely friend of ours shifted the sofa bed out from the nursery (it weighs approximately 1,000,000kg, so no easy task), which meant we had the room to put the cot together, and arrange as we saw fit. There’s still a bit to do in terms of layout of the nursery – there’s a hideous bookcase full of rubbish that needs moving to another room, our pictures need hanging on the wall, and the built in robe is packed to the brim with god knows what – but we’re getting there! Once I’m happy with the room and we’ve got everything in that we have bought so far, I’ll take some pics to show you the transformation. I’ve also been shopping a bit more (eek!) now that I know we’re having a girl. I’ve managed to restrain myself quite a bit, but the sales are on at the moment, and there are so many cute baby girl’s things, I just can’t help it. Like I’ve said previously, I’m not a fan of the pink explosion, but I don’t mind the colour itself. So, yes, I’ve bought some pink stuff, but I’ve also bought gorgeous yellow, mint, purple and white gear too. I’m feeling a lot more kicks now, mainly at night which seems to be when Grub is at her most active. It’s been lovely knowing we’re having a girl, as now I can think of her as more than an “it” and start to connect a little bit. She is really giving herself a good workout in the evenings, and it’s wonderful knowing that she’s doing well in there. Otherwise I’ve been pretty tired this week, getting back into the swing of work has been harder than I’d anticipated, and I’m feeling very sore dragging my sorry arse out of bed in the mornings, in the cold, dark mornings. Come on Spring!